EKOCENTER pilot site in Heidelberg, South Africa. NEW YORK, Sept. 24, 2013 /3BL Media/ – The Coca-Cola Company, DEKA R&D, IBM, Inter-American Development Bank (IDB) Group, McCann Health, NRG Energy, Inc. (NRG), Qualcomm Technologies, Inc. and UPS®, today announced they will work together to bring EKOCENTERTM – a kiosk designed to improve the well-being of communities – to 20 countries by the end of 2015. Coca-Cola’s announcement brings to action its 2012 commitment with DEKA R&D to provide safe drinking water to communities through the SlingshotTM water purification system, ensuring communities are more sustainable. Today, we are announcing that we will place between 1,500 and 2,000 units in the form of EKOCENTERs, “downtowns in a box,” or SlingshotTM water purification systems to deliver further services beyond clean water, in Africa, Asia, Latin America and North America by the end of 2015. Each EKOCENTER will offer a locally tailored mix of products, services and resources that may include safe drinking water, sustainable energy, wireless communications, refrigerated vaccination storage, health education, and other functionality to jump-start entrepreneurship opportunities and community development. Through this commitment, we aim to deliver 500 million liters of safe drinking water, while promoting greater local development in communities that need it most. Women and entrepreneurs from local communities will be recruited to operate each EKOCENTER, creating new opportunities for employment in the communities where we install and operate EKOCENTER. Entrepreneurs selected to operate the EKOCENTERs will be given business skills training similar to that provided by Coca-Cola’s 5by20 program, an initiative designed to economically empower 5 million women entrepreneurs across Coca-Cola’s value chain by 2020. This collaboration is the first step in Coca-Cola’s long-term vision of deploying thousands of EKOCENTERs globally in the next decade. Currently, one EKOCENTER test site has been launched in Heidelberg, South Africa, and there are plans to install one additional EKOCENTER pilot by the end of 2013. The Coca-Cola Company and its bottling partners will lead the project, managing the site selection, installation and maintenance of each EKOCENTER. They also will utilize their local operations to support on-the-ground needs and serve as a distribution channel for EKOCENTER placements. The Company led the EKOCENTER vision and design as well as the creation and installation of the prototype unit in South Africa.  The Coca-Cola Company & DEKA R&D will supply the SlingshotTM water purification system as well as design and infrastructure expertise to build and install EKOCENTER. 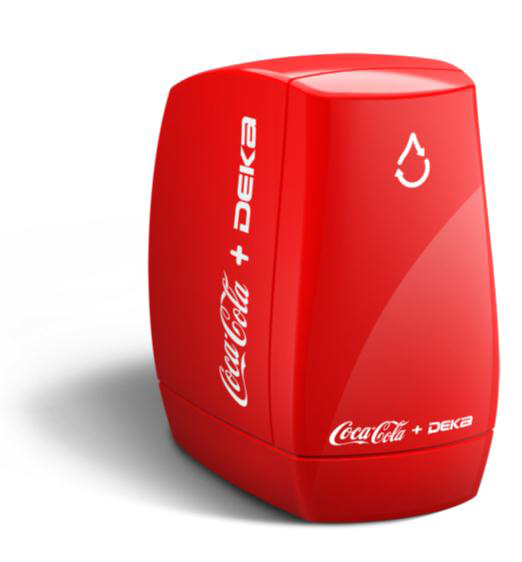 DEKA R&D supported the design and creation of the first EKOCENTER test site in South Africa and also has an additional partnership with Coca-Cola to deliver safe drinking water using the Slingshot technology at schools, health clinics and community centers in Africa and Latin America. IBM will contribute technology and business consulting services to provide high-level business plan development and technology plan development for EKOCENTER. IBM also will explore and advise on potential technology applications for treating return water. IDB will provide funding and implementation support for EKOCENTER placements in Latin America. It also will help establish relationships with local non-governmental organizations (NGOs) to support health and sanitation education for communities receiving EKOCENTERs. IDB is a funding and implementation partner for Coca-Cola’s existing safe drinking water partnership with DEKA R&D in Latin America. McCann Health, a part of McCann Worldgroup, will work with Coca-Cola and other partners to create a micro-business model for EKOCENTER. Additionally, it also will develop consumer-focused health and sanitation programs and messaging for communities receiving an EKOCENTER. NRG is the official energy partner for EKOCENTER, providing solar panels and battery storage to power EKOCENTER, enabling each one to be a self-sustaining, off-the-grid operation. NRG also is assisting DEKA R&D with development of the StirlingTM engine technology which could provide another energy option for EKOCENTER in the long-term. NRG provided solar panels and battery storage for the first EKOCENTER test site earlier this year. 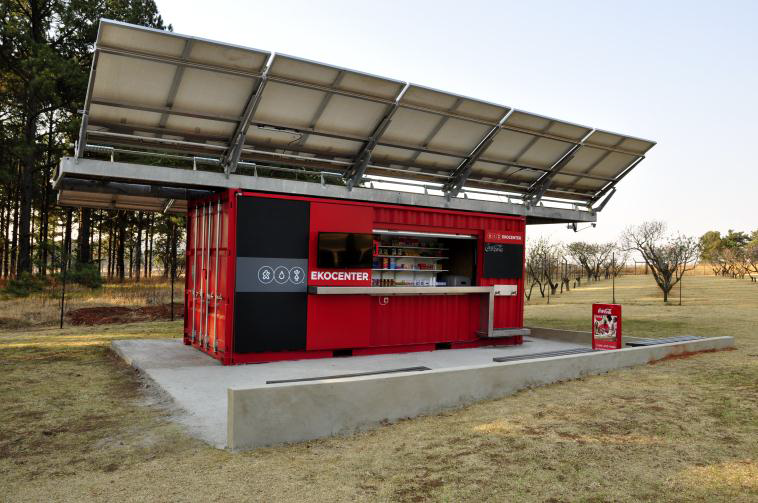 Qualcomm Technologies, Inc., a wholly-owned subsidiary of Qualcomm Incorporated, will provide guidance to Coca-Cola on the inclusion of wireless communications technologies, such as mobile devices and wireless Internet connectivity, for EKOCENTER. UPS will serve as a logistics partner, providing technical expertise on global operations and deployment of EKOCENTER. Coca-Cola also intends to work with TechnoServe as a strategic advisor for EKOCENTER. TechnoServe will help establish a sustainable business model and a metrics-based monitoring and evaluation plan, as well as support identifying and training local entrepreneurs for EKOCENTER. Coca-Cola has a long-term relationship with TechnoServe on key projects in Haiti and countries in Africa under its 5by20 and sustainable agriculture programs. At a broad level, EKOCENTER is intended to be a financially sustainable, globally replicable social enterprise model, run by primarily local female entrepreneurs. EKOCENTERs will initially operate with a Slingshot water purification system, power source and commercial space. The partnership will then work to grow the technology, once optimally developed, to be a fully equipped retail outlet. While EKOCENTER’s core mission is to improve the physical well-being of people in rural communities, focused on providing safe drinking water to approximately 45,000 people in its first two years, it also offers other opportunities to communities. Through EKOCENTER, the partners aim to empower communities through connectivity to information and the outside world; provide a safe gathering place; create jobs, skills and services; and offer incentives for local programs in a community, like recycling or sanitation services. The Coca-Cola Company will work with its local bottling partners to ensure that the EKOCENTER and Slingshot technologies are working properly, and that the drinking water provided complies with applicable safe drinking water and health standards. EKOCENTER supports Coca-Cola’s commitment to replenish the water used in its beverages and their production, its 5by20 program to economically empower 5 million women entrepreneurs across its value chain by 2020, and its continued commitment to foster sustainable communities globally. The Slingshot water purification technology, developed by DEKA R&D, utilizes vapor compression distillation technology to turn nearly any source of dirty water into safe drinking water. The Coca-Cola Company announced a partnership with DEKA R&D in September 2012 to install and operate 1,500 Slingshot water purification systems in rural communities in Africa, Asia and Latin America with pilots starting in South Africa, Mexico and Paraguay in 2013. Coca-Cola and the organizations participating in the EKOCENTER collaboration will be hosting a press conference live from the CGI Annual Meeting at 11 a.m ET today for media to learn more about this partnership. The press conference will be in Press Room D at the Sheraton New York City for those attending in person. For those attending remotely, it will be streamed live at https://new.livestream.com/CGI/. @CocaColaCo will be hosting a Twitter Chat today, September 24, from 12:30-1:30 p.m. ET to discuss its EKOCENTER plans and address public comments and questions. The Twitter Chat will be hosted by Derk Hendriksen, EKOCENTER program leader, and Dean Kamen, President, DEKA R&D and inventor of the Slingshot water purification system. For more information, visit www.coca-colacompany.com/EKOCENTER. the world's most valuable brand, our Company's portfolio features 16 billion-dollar brands including Diet Coke, Fanta, Sprite, Coca-Cola Zero, vitaminwater, Powerade, Minute Maid, Simply, Georgia and Del Valle. Globally, we are the No. 1 provider of sparkling beverages, ready-to-drink coffees, and juices and juice drinks. Through the world's largest beverage distribution system, consumers in more than 200 countries enjoy our beverages at a rate of more than 1.8 billion servings a day. With an enduring commitment to building sustainable communities, our Company is focused on initiatives that reduce our environmental footprint, support active, healthy living, create a safe, inclusive work environment for our associates, and enhance the economic development of the communities where we operate. Together with our bottling partners, we rank among the world's top 10 private employers with more than 700,000 system associates. For more information, visit Coca-Cola Journey at www.coca-colacompany.com, follow us on Twitter at twitter.com/CocaColaCo or check out our blog, Coca-Cola Unbottled, at www.coca-colablog.com. DEKA Research & Development Corporation, founded in 1982 by Dean Kamen, has partnered with many medical industry leaders to introduce new technologies that transform lives. DEKA R&D’s 300 engineering professionals use a multidisciplinary approach that combines basic science with advanced technology to identify critical 7 Classified - Internal use needs and solutions. DEKA R&D’s activities include the full spectrum of research and product development, as well as low-volume manufacturing. DEKA R&D has developed products in robotics, mobility, prosthetics, and energy generation, and has more than three decades of experience in the field of fluid control and delivery. DEKA R&D is located in Manchester, New Hampshire. For more information about IBM's Citizenship programs, please visit www.ibm.com/responsibility. McCann Health is a part of McCann Worldgroup, the largest marketing communications agency network in the world, and is a leading healthcare agency network owned by Interpublic Group [NYSE: IPG]. Comprising the world’s most connected health and wellness experts, McCann Health is the most awarded professional and consumer health communications network with the largest international expertise spanning 35 countries and 57 offices. McCann Health’s global network includes McCann HumanCare, McCann Healthcare, McCann Regan Campbell Ward, McCann Torre Lazur, McCann Complete Medical, the leading worldwide medical communications practice, and Double Helix, an international healthcare consultancy focused on working with clients on strategic market research and market access issues. For more information, visit www.mccannhealth.com. NRG is at the forefront of changing how people think about and use energy. NRG delivers cleaner and smarter energy choices for its customers, backed by the nation’s largest independent power generation portfolio of fossil fuel, nuclear, solar and wind facilities. A Fortune 500 company, NRG is challenging the U.S. energy industry by becoming one of the largest developers of solar power, building the first comprehensive electric vehicle ecosystem, and providing customers with the most advanced smart energy solutions to better manage their energy use. In addition to 46,000 megawatts of generation capacity, enough to supply nearly 40 million homes, our retail electricity providers – Reliant, Green Mountain Energy and NRG Residential Solutions – serve more than two million customers. More information is available at www.nrgenergy.com. Connect with NRG Energy on Facebook and follow us on Twitter @nrgenergy. Qualcomm Incorporated (NASDAQ: QCOM) is the world leader in 3G, 4G and next-generation wireless technologies. Qualcomm Incorporated includes Qualcomm’s licensing business, QTL, and the vast majority of its patent portfolio. Qualcomm Technologies, Inc., a wholly-owned subsidiary of Qualcomm Incorporated, operates, along with its subsidiaries, substantially all of Qualcomm’s engineering, research and development functions, and substantially all of its products and services businesses, including its semiconductor business, QCT. For more than 25 years, Qualcomm ideas and inventions have driven the evolution of digital communications, linking people everywhere more closely to information, entertainment and each other. For more information, visit Qualcomm’s website at www.qualcomm.com, OnQ blog, Twitter and Facebook pages. Qualcomm is a trademark of Qualcomm Incorporated, registered in the US and other countries. All Qualcomm Incorporated trademarks are used with permission. UPS (NYSE: UPS) is a global leader in logistics, offering a broad range of solutions including the transportation of packages and freight; the facilitation of international trade, and the deployment of advanced technology to more efficiently manage the world of business. Since its founding in 1907, UPS has built a legacy as a caring and responsible corporate citizen, supporting programs that provide long-term solutions to community needs. Founded in 1951, The UPS Foundation is responsible for facilitating community involvement to local, national, and global communities. In 2012, UPS and its employees, active and retired, invested more than $97.5 million in charitable giving around the world. The UPS Foundation can be found on the web at UPS.com/foundation. To get UPS news direct, visit pressroom.ups.com/RSS. "IBM is committed to lending its strategic expertise to help The Coca-Cola Company and its other partners support environmental efforts that are designed to achieve sustainability and economic opportunity," said Stanley S. Litow, IBM Vice President, Corporate Citizenship and Corporate Affairs, and President, IBM Foundation. “We are pleased to be joining Coca-Cola and DEKA R&D, alongside IBM, NRG, Qualcomm, and UPS to create a highly innovative, robust, women-centric business model that empowers women and brings new capabilities to rural communities,” said John Cahill, Global CEO, McCann Health. “By bringing clean water, electricity and mobile communications through an integrated platform into some of the most needy communities, the partners hope to encourage women entrepreneurs and facilitate a multiplier effect that catalyzes local economies." “UPS is actively engaged throughout the world with its humanitarian relief non-profit partners by leveraging its logistics and supply chain expertise to bring relief to communities in crisis, many of which are in emerging markets,” said Eduardo Martinez, President of The UPS Foundation. “We strongly believe the EKOCENTER initiative will bring relief to communities and spur the development and growth needed to enhance their future prospects and ultimately the global economy will benefit. UPS is committed to helping Coca-Cola access global markets via our integrated network in order to improve access to clean water and other basic services to those in need.